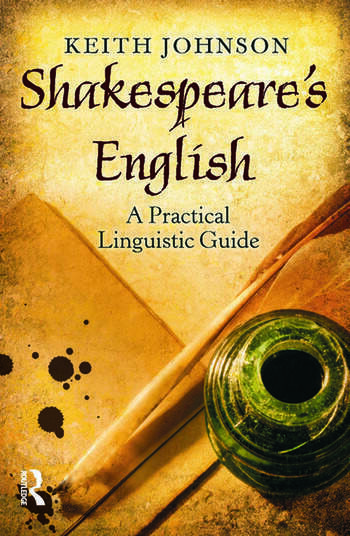 Shakespeare's English: A Practical Linguistic Guide provides students with a solid grounding for understanding the language of Shakespeare and its place within the development of English. With a prime focus on Shakespeare and his works, Keith Johnson covers all aspects of his language (vocabulary, grammar, sounds, rhetorical structure etc. ), and gives illuminating background information on the linguistic context of the Elizabethan Age. As well as providing a unique introduction to the subject, Johnson encourages a "hands-on" approach, guiding students, through the use of activities, towards an understanding of how Shakespeare's English works. Shakespeare's English is perfect for undergraduate students following courses that combine English language, linguistics and literature, or anyone with an interest in knowing more about the language with which Shakespeare worked his literary magic. 1.1. Shakespeare’s language? Why study it? 1.3 How hard is Shakespeare’s English? 1.5 Shakespeare’s English? Which Shakespeare? 7. Verse and Prose: Iambic pentameters all the time? 9.1 How different . . . and why bother? 9.6 Shakespearean pronunciation: how do we know? Keith Johnson has published widely in the area of applied linguistics, including Introduction to Foreign Language Learning and Teaching (Pearson Education, 2008). He has many years of experience in directing MA level courses for participants coming from all over the world, and is now Emeritus Professor of Linguistics and Language Education at Lancaster University.